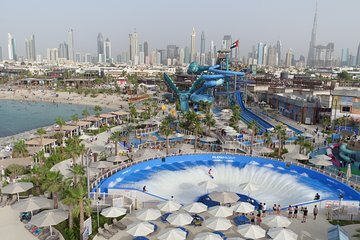 Laguna Waterpark is one of Dubai’s most popular water parks, located in the beachside district of La Mer. This full-day pass allows multiple entries throughout the day and unlimited access to the park’s slides, swimming pools, and attractions. Get your adrenaline pumping at the Water Slide Tower, go surfing in the WaveOz 180 FlowRider pool—one of only three in the world—or head out to explore the beaches and restaurants of La Mer.